Adding and editing users in PI is a breeze. Even better if you have XPM synced - it allows you to directly import the users from XPM to PI. Now isn't that convenient? Note: Users created in Practice Ignition will not push across to WorkflowMax/XPM. To create users manually in Practice Ignition, click on Settings then go to Teams and click on the Add User button. A slider will pop out from the right where you can enter the new users name and email address. You can only use an email address once in Practice Ignition so you will need multiple email addresses if you are going to set up multiple accounts. If you are using gmail, you can do this by adding a prefix with a plus sign before the @ sign in your email. eg. we will see [email protected] and [email protected] as 2 different accounts, but Gmail will recognise them as the same account and accept mail sent to both. We presently have 2 types of users - Standard and Administrator. Administrators have access to everything in the Practice Ignition account, Standard users have access to everything except for the Settings, the Service Library, and client payment details. As an administrator, you can easily setup your users' access in Practice Ignition. It gives you the authority to choose the role of your users, so you won't have to worry about your settings and services having accidentally altered. Under Role you can choose to make the user a 'Standard' or 'Administrator' user. The Job Title that is entered here is visible to your clients. You can now click the orange Save User button at the top right hand corner. If you enabled Send Invitation, it will send an email invitation to the user with a link for them to sign into Practice Ignition. 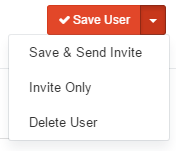 If you have previously saved this user, just click on the drop-down arrow beside the Save User button then click Invite Only. If you already have your staff in WorkflowMax/Xero Practice Manager you can import and link users in Practice Ignition to these. 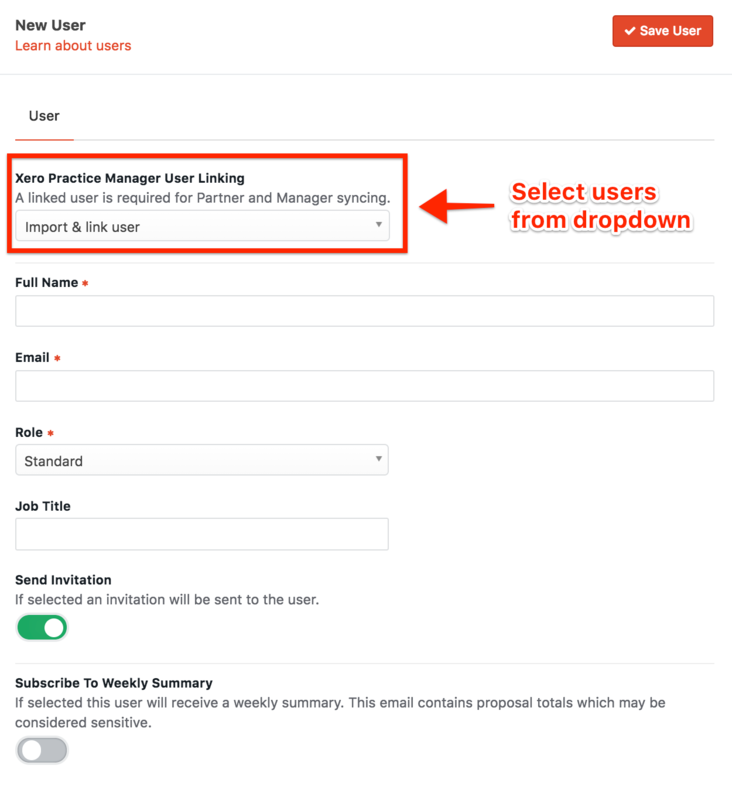 After connecting WorkflowMax/Xero Practice Manager, a Xero Practice Manager User Linking dropdown will appear in the Add User menu. 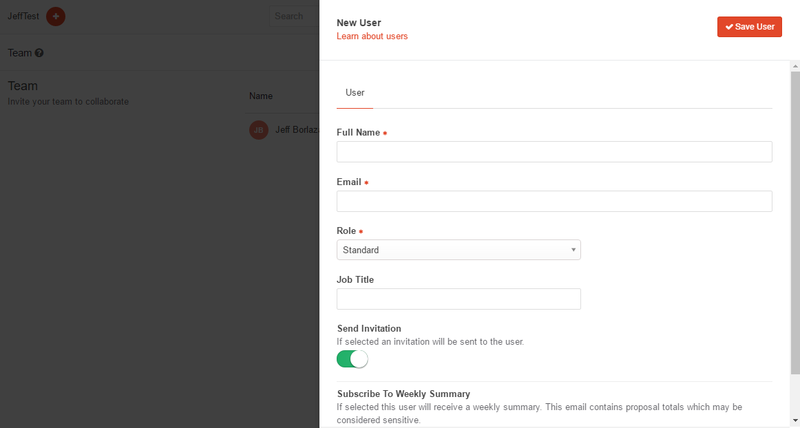 Selecting a staff member form this dropdown will pre-populate the name and email fields - you can add a job title and select a role. 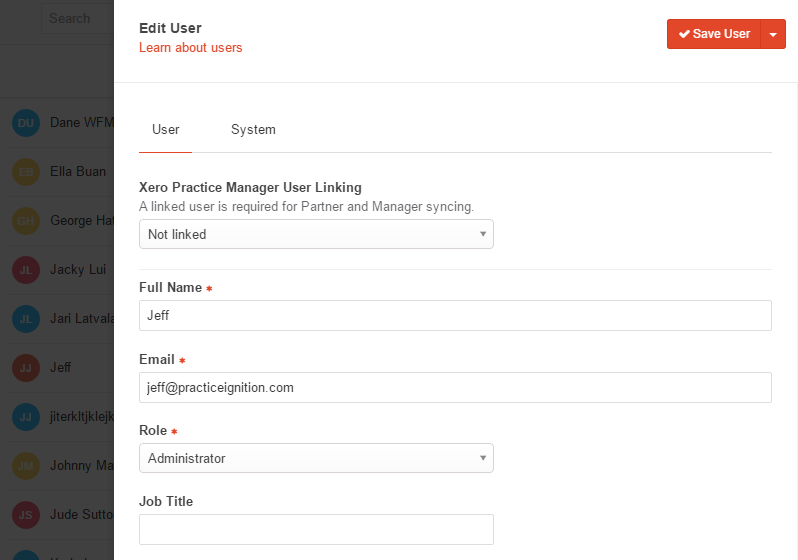 Click Save User, and the user in Practice Ignition will now be linked to the staff member in WorkflowMax/Xero Practice Manager. You will have to add any staff that you wish to allocate a job on a proposal to as a user in Practice Ignition. If you do not wish for them to have access to Practice Ignition, turn off Send Invitation and they will not receive access. Please note, due to a UI issue, this dropdown may still say 'Not Linked' when a user is linked, to check, it is best to see if they still appear in the dropdown. XPM staff can only be linked once to a PI user and will disappear from this list when they are linked. To edit users in Practice Ignition, simply go to Settings, then into Teams, and click on the user you want to edit. A slider will pop out from the right hand side where you can edit any of the fields, and also see a system record of their details. Once you have finished editing, just click the Save User button and you're done. 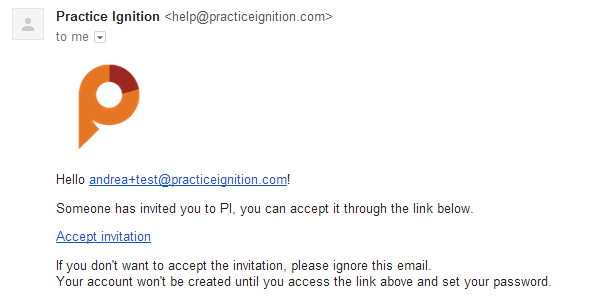 For the user's you've created to be able to log in and start using Practice Ignition, you need to invite them in. To do this, click into the user you wish to invite under Team in Settings. Next to the Save User button at the top right, click on the down arrow which will give you the option to Save & Send Invite, or Invite only. If you have made changes to the user's details, you will want to click Save & Send Invite, otherwise click Invite Only to send them an email which will have a link for them to log in and create a password for their account. The creator of a Practice Ignition account is what we call the 'Principal user' and also the 'billable user'. This account gets all general error notifications and is also linked to the billing details applied to the account. If you are not going to manage the billing for your client, then we recommend getting your client's director (or person to be responsible for Practice Ignition there) to create the account, and then add you in as an administrator.